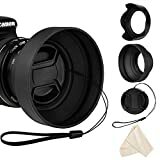 67MM Lens Hood KIT Included is a 67MM Hard Lens Hood and 67mm Soft Lens Hood for Lens and Cameras with a 67MM Thread Size - NOTE: Please verify the size of your lens thread prior to purchasing 67mm Lens Hoods are compatible with the following lenses and ALL Lenses and Cameras with a 67mm Lens Thread.CanonCanon EF 70-300 F4-5.6 IS II USMCanon EF-S 18-135mm F3.5-5.6 IS USMCanon EF-S 10-18mm f/4.5-5.6 IS STMCanon EF 70-200mm f/4L USMNikonNikon AF-P Nikkor 70-300mm F4.5-5.6E ED VRNikon AF-S DX Nikkor 18-300mm F3.5-6.3G ED VRNikon AF-S DX Nikkor 18-140mm f/3.5-5.6G ED VRNikon AF-S Nikkor 70-200mm f/4G ED VRNikon AF-S Nikkor 28mm f/1.8GNikon AF-S Nikkor 85mm f/1.8GSonySony FE 85mm F1.8Sony FE 24-70mm F4 ZA OSS Carl Zeiss Vario Tessar T*Sony FE 28-70mm F3.5-5.6 OSSSony E PZ 18-200mm F3.5-6.3 OSSand all Lenses and Cameras with a 67mm ThreadHEROFIBER CLOTH - Included is a HeroFiber ultra gentle cloth that is specially designed to clean electronics and accessories. Set Includes: 67 MM Tulip Flower Hood + 67 MM Rubber Lens Hood + Premium MagicFiber Microfiber Cleaning Cloth. NOTE: This kit is compatible with all 67mm lenses. Please verify your camera's lens thread size before ordering. Your camera's lens thread size will be marked somewhere on the lens barrel or printed underneath your lens cap. This number is always preceded by a "Ø" (diameter) symbol. For example: Ø67 = 67mm lens thread size. 67MM Lens Hood Included is a 67MM Hard Lens Hood for Lens and Cameras with a 67MM Thread Size - NOTE: Please verify the size of your lens thread prior to purchasing LENS HOOD PURPOSE - The Lens Hood is used for reducing lens flare and unnatural light, and to simply protect the front of the lens from basic damage.LENS HOOD WARRANTY - Lens hood is protect with a Xtech 1 Year 100% Satisfaction Guarantee.HEROFIBER CLOTH - Included is a HeroFiber ultra gentle cloth that is specially designed to clean electronics and accessories. Screw mount type, crown flower shape, can be attached to 67mm lens or filter thread.Provides protection from unwanted light flares and accidental physical damages. For CALIFORNIA residents only: WARNING: This product contains chemicals including DEHP, which is known to the State of California to cause cancer and birth defects or other reproductive harm.Please note that by posting this Proposition 65 warning, we are notifying you that one or more of the Proposition 65 listed chemicals may be present in a product. With Unique Bargains' products, the exposure to these chemicals may be of no significant risk to you, but out of caution, we have elected to place this warning on our site to make sure our customers are informed.You can find more infomation at http://www.oehha.ca.gov/proposition-65/about-proposition-65. 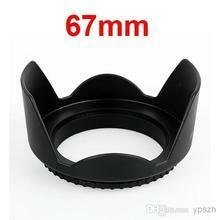 67mm Universal Metal Wide Angle Circular Lens Hood Shade New! 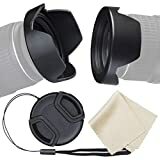 ULTIMATE LENS HOOD SET YOU NEED, it includes: 67mm reversible tulip flower lens hood, 67mm 3 stages collapsible rubber lens hood, 67mm center pinch lens cap, 6"x7" (15cm x 18cm) premium microfiber cleaning cloth..
REVERSIBLE TULIP FLOWER LENS HOOD: Unique design for quickly detaching and mounting. Normal mode and reverse mode for using. The only flower lens hood on the market that lets you use a lens cap while having the lens hood mounted..
COLLAPSIBLE RUBBER LENS HOOD: 3-in-1 design for use with wide-angle, standard, telephoto zoom/non-zoom lenses. 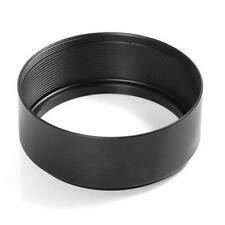 Prevents lens flare caused by extraneous light and protects against unexpected bumps or shock.. 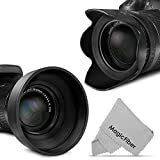 PAIR WITH FILTER: Our lens hoods provide with Filter Thread, allowing you to pair this hood with filter and lens cap..
NOTICE: This set is compatible with all 67mm lenses, please verify your camera's lens thread size before ordering. Your camera's lens thread size will be marked somewhere on the lens barrel or printed underneath your lens cap. This number is always preceded by a "Φ" (diameter) symbol.For example: Φ67 = 67mm lens thread size..
Package Contains:- 67MM Reversible Tulip Flower Lens Hood x 1pcs;- 67MM Collapsible rubber lens hood x 1pcs;- 67MM Center Pinch Lens Cap x 1set;- 6"x7" (15cm x 18cm) Premium Microfiber Cleaning Cloth x 1pcs;Compatible with: Canon Rebel (T5i T4i T3i T2i), EOS (700D 650D 600D 550D 70D 60D 7D) DSLR Cameras with the 18-135mm EF-S IS STM zoom Lens. Nikon (D6700 D7000 D7100 D90) DSLR Cameras with the 18-105mm f/3.5-5.6 AF-S DX VR ED zoom Lens. Other 67mm camera lens. 67mm Collapsible Rubber Lens Hood- Rubber lens hoods provide extra protection from accidental bumps or scratches thanks to high quality shock absorbent rubber.- The addition of a lens hood can help prevent flares-those circles of light that can accompany images where a strong light source is just outside the frame.- 3-in-1 Collapsible design, Extend to full length for use with a telephoto lens, Collapse midway for wide angle shots, Collapse completely for macro photography or easy and compact storage- Features a metal ring screw mount for easy attachment to your lens or filter. Specially designed for a tight and secure fit. No wobbling or cross-threading.- Double threaded screw mount also allows you to attach lens caps, filters, or other accessories on the hood itself without the need to remove the hood first.67mm Reversible Camera Lens Hood- Professional tulip shape design (also known as flower or petal shape) allows for greater versatility. Perfect for standard or zoom lenses.- Unique design for quickly detaching and mounting. Normal mode and reverse mode for using.- Easy to use screw mount lens hood screws right onto your lens or filter.- Features a rear locking ring to allow user to rotate the hood in either direction and capture the exact amount of shading desired. 4 in 1 Camera Lens Hood Set - Come with 67mm Reversible Tulip Flower Lens Hood + 3 Stages Collapsible Rubber Lens Hood + Lens Cap with Cap Keeper Leash + Microfiber Lens Cleaning Cloth, what a useful camera lens accessory for Nikon, Canon, Sony and other DSLR Cameras.. Blocks Excess Sunlight - The lens hood will block excess sunlight for enhanced photography and video footage. They will reduce lens glare and flare and boost the black in your pictures..
Reversible Tulip Flower Lens Hood - 2 installations modes (Normal mode and reverse mode), Normal Mode for blocking excess sunlight; Reverse Mode for protecting your lens and easy storage in your bag. You can also use a lens cap while having the lens hood mounted..
Collapsible Rubber Lens Hood - The rubber lens hood can be folded out in 3 steps to offer different levels of sun shading. 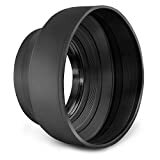 Perfect for wide-angle, standard, telephoto zoom/non-zoom lenses..
Universal compatibility - The camera lens hoods fit for all camera lenses with a 67mm filter thread front. NOTICE: Please verify your camera's lens thread size before purchase. The lens diameter is the number following by symbol 'Ø'..
Sony Alpha A7s Pro Digital Lens Hood (Flower Design) (67mm) + Nw Direct Microfiber Cleaning Cloth. A lens hood will help block out light that is coming into the lens and causing flare by striking the outer lens elements (the glass pieces that make up the entire lens) at a less than optimal angle. This is light that never would have made it to the sensor and isn’t needed. Instead, it causes those discolored spots you might have seen, shaped like the lens aperture (typically a hexagon or octagon). While lens flare also occurs from light coming directly into the lens, flare from off-angle light can be prevented. Included is the 67MM Filters Set includes: UV Filter - designed to protect the lens from common damage such as scratches, dirt and dust plus it filters out the Ultra Violet rays from entering the photo + 67mm CPL (Circular Polarizing) Filter for Outdoor filming and 67mm ND (Neutral density) Filter designed to filter out unwanted neon and artificial light. 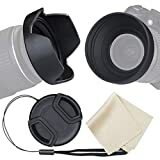 67mm Filters and Accessories Kit includes a Protective Filters Case + 67mm Hard Tulip Shaped Lens Hood + 67mm Squeeze Lens Cap and Lens Cap Holder designed to prevent the lens cap from disappearing + Cleaning Pen & Cleaning Blower. The 67mm Kit is compatible with CANON EOS 80D 70D 60D 7D, 7D, 6D, Mark ii 5D, EOS Rebel T6i T6S T6 T5 T5i T4i T3 T3i T2i T1i EOS 1300D 1200D 1100D 760D 750D 700D 650D 600D 550D, Nikon D500, D750, D810, D800, D610, D600, D7200, D7100, D5500, D5300, D5200, D5100, D3300, D3200 with a 67mm Lens. NOTE: This 67mm Filters and Lens Hood Kit fit 67mm Lens thread only, please verify the mm size thread of your lens prior to purchasing.Additionally included in Kit is a Protective Filters Case + 67mm Hard Tulip Shaped Lens Hood + 67mm Squeeze Lens Cap and Lens Cap Holder designed to prevent the lens cap from disappearing + Cleaning Pen & Cleaning Blower + a HeroFiber® Ultra gentle cleaning cloth designed for extra care and gentle cleaning of sensitive electronics and accessories. 🎁 Easy Reversible - The pop-on, pop-off design with metal ball clip mounting makes the lens hood much easier and quicker to be mounted and detached. Also avoids the possibility of accidental loss. Easily reversed to fit snugly in camera bag in conjunction with the lens cap for protection..
🎁 Screw-on Lens Hood - Firstly screw the lens base to your camera lens, Click it with Normal Mode for blocking excess sunlight; Or Reverse Mode for protecting your lens and easy storage..
🎁 Blocks Excess Sunlight - The lens hood will block excess sunlight for enhanced photography and video footage. They will reduce lens glare and flare and boost the black in your pictures.Blocks Excess Sunlight -This lens hood has an accurately cut thread and stays firmly in place. It increases contrast in shots by eliminating stray light which in turn, can help avoid flare. No vignetting at wide angle setting. It reduces side-wards glare from sunny shots..
🎁 3 in 1 Camera Lens Hood Set - Come with 67mm Reversible Tulip Flower Lens Hood + Lens Cap with Cap Keeper Leash + Microfiber Lens Cleaning Cloth, what a useful camera lens accessory for Nikon, Canon, Sony and Other DSLR Cameras..
🎁 Universal Compatibility - This camera lens cap fits for all camera lenses with a 67mm filter thread front. NOTICE: Please verify your camera's lens thread size before purchase. The lens diameter is the number following by symbol 'Ø'. Eg: Φ67 = 67mm lens thread size..
Canon EOS Rebel T3 Pro Digital Lens Hood (Flower Design) (67mm) + Nwv Direct Microfiber Cleaning Cloth. A perfect Brand New Professional Lens Cap for 67mm Lens CapCamera Lens Cap made by high quality durable plastic.Unique ergonomic clip on design allows it easy to use when the lens has hood, whether your hands are tender or coarse, it will take on or off easy when you using the hood, make your inspiration always on line.Lens Cap comes with string to prevent missing.Weight: 16gFor CALIFORNIA residents only: WARNING: This product contains chemicals including DEHP, which is known to the State of California to cause cancer and birth defects or other reproductive harm.Please note that by posting this Proposition 65 warning, we are notifying you that one or more of the Proposition 65 listed chemicals may be present in a product. With Unique Bargains' products, the exposure to these chemicals may be of no significant risk to you, but out of caution, we have elected to place this warning on our site to make sure our customers are informed.You can find more infomation at http://www.oehha.ca.gov/proposition-65/about-proposition-65. 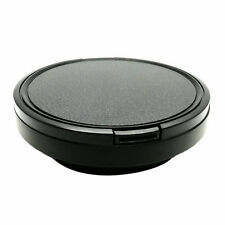 Camera Lens Cap made by high quality durable plastic.Lens Cap comes with string to prevent missing.Weight: 16g.Package Content: 1 x Hood Cap.